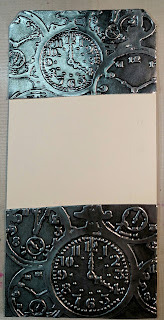 Although I've been a Tim Holtz fan for awhile, I had never taken the time to do one of his tags until last month. Of course it was the December tag & I loved doing the Christmas theme then uploaded it to his blog. Much to my surprise my tag was one of the 12 chosen to receive a gift from Tim...it may have been beginner's luck but I was thrilled! After having so much fun doing that tag, I decided to continue to play along with Tim Holtz 12 Tags of 2016. 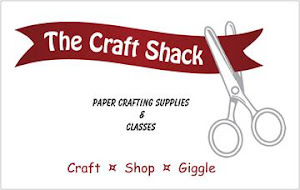 To make this even more fun, after I do my tag, I'm getting together with a few of my friends once a month at The Craft Shack & they'll make Tim's tag too. 1. I used 2 Ranger #10 manilla tags, one for the tag & the other for the metal technique. You can use a plain piece of cardstock too. I cut the 2nd tag to fit in the embossing folder. The width was perfect & the length was cut to about 5 1/2". Then I cut a piece of Ranger Foil Tape Sheet so it was slightly bigger than the piece of the tag. It is sticky backed so after taking the covering off the back, I placed it onto the piece of the cut tag then trimmed the silver that was hanging over the edge. 2. The reason I used a 2nd piece of tag (or cardstock) is because I'm not as brave as Tim. If you watch his video he slits the top of the embossing folder. To have a piece of metal at the stop & bottom of my finished tag I would have had to cut the slit in the top of the Alterations Texture Fades Pocket Watches Embossing Folder because it has a specific top & bottom. 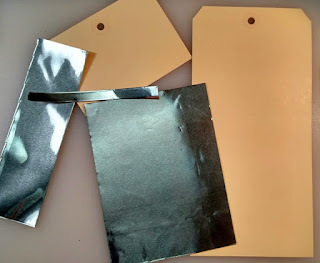 By using a separate piece of tag or cardstock, I can place the entire piece in the folder then cut it to make 2 pieces. Isn't it pretty...nice & shiny? It won't be soon! 3. Next I went over the embossed silver piece with Black Soot Paint, letting it dry a bit, then gently wiping the paint off with a paper towel. 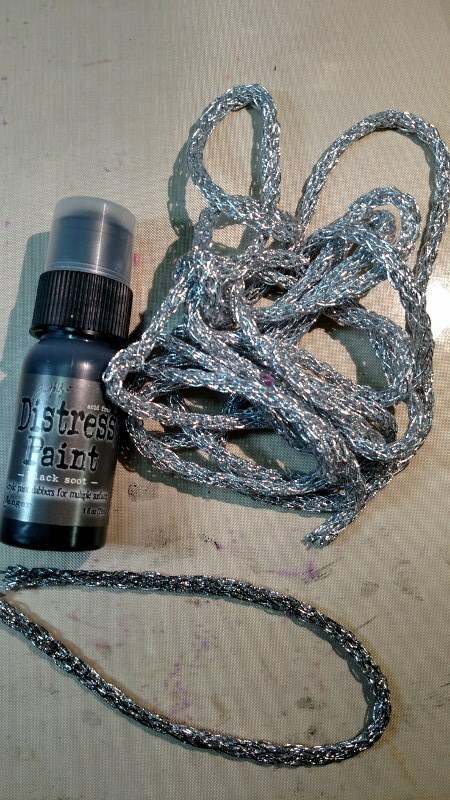 I just used the paint dauber on the bottle but you can also use a blending tool. If you want it darker you can add another coat of paint & wipe it off again. Remember once the paint dries it's permanent so make sure you clean up your workspace with water right away. 4. 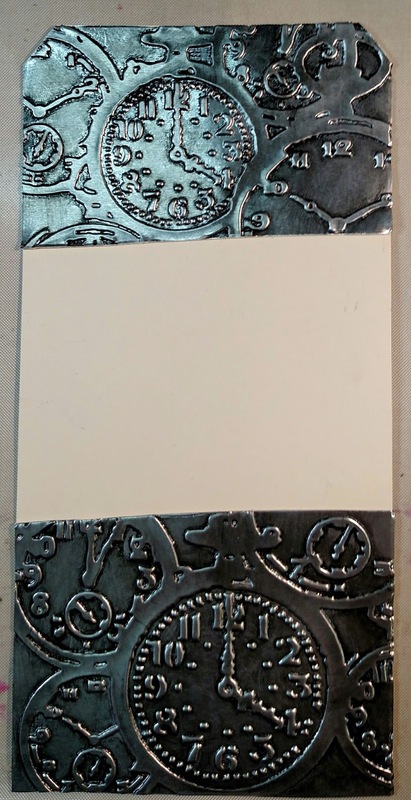 After the paint dried I cut the silver piece into 2 pieces (the top is smaller than the bottom) & adhered it to the main tag using Scor-Pal-1/2" double sided tape. 5. I cut the top corners off & punched through the hole in the top. This is the end result of the Industrious Metal Technique...pretty neat & easier than it looks! 6. Now onto the Chalkboard technique which Tim does using regular black cardstock. I cut the piece of SU Basic Black cardstock bigger than the gap on the tag; then tore the edges, making sure it covered the edges of the metal. I used an Artquest Static Pad to remove any static on the cardstock. 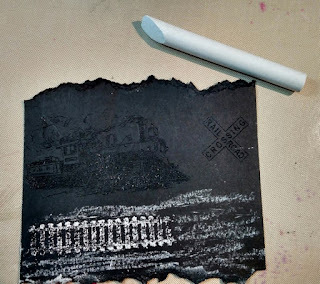 Using Ranger Embossing Ink, I stamped the train, tracks & RR crossing sign from Tim Holtz's Here & There stamp set then sprinkled it with Ranger Frosted Crystal Antiquities Embossing- Powder. 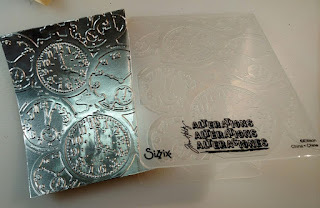 Make sure you don't over heat the embossing powder or the technique doesn't work well. 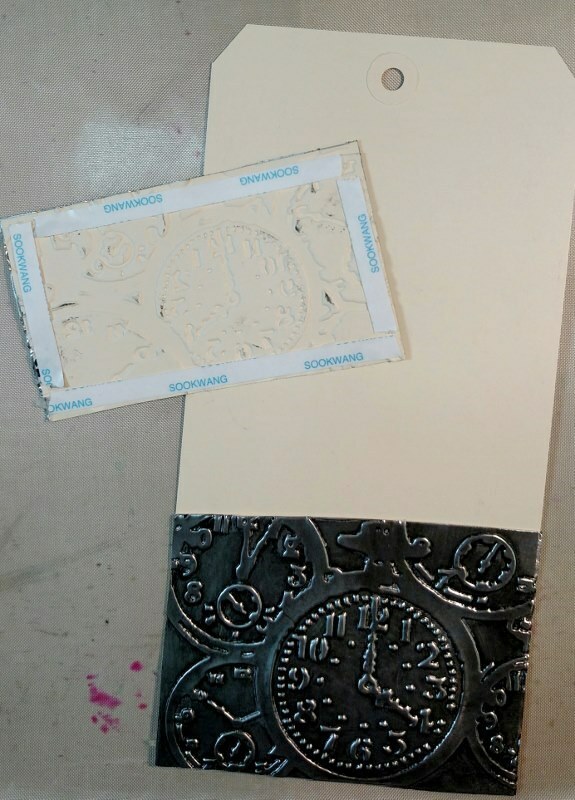 Next take a regular piece of chalk (if it's new rub it on a plain piece of paper to get an angle) & gently rub it over the embossed area. Then using your finger, rub it out until you get the effect you like. I used double side tape to adhere it to the tag. 7. The Alterations Movers & Shapers Pocket Watch is cut from grungeboard on a Magnetic Tray which holds the die in place when cutting. 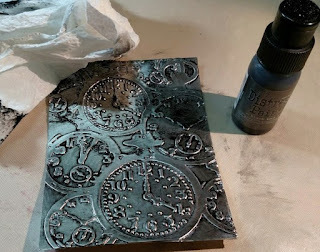 After it was cut out, I went over it with Brushed Pewter Paint. 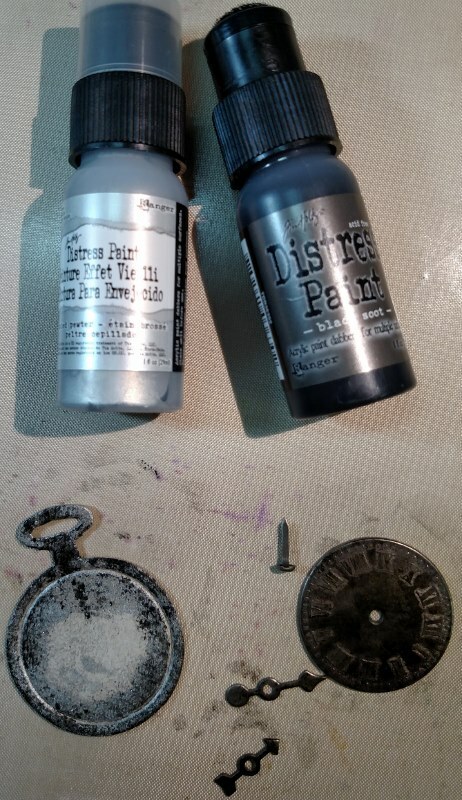 Once the paint dried I used my finger to randomly rub Black Soot paint over the watch, spinners and clockface for a distressed looked. I used Glossy Accents to adhere the watch face to the watch & then to the tag. 8. The chain cording from Mon Ami Gabbi was distressed by rubbing Black Soot paint over both sides. After it dried I doubled it & looped it through the hole. 9. To finish embellishing the tag, I stamped the train time table from Tim Holtz's The Journey stamp set on SU Whisper White card stock in Black Soot Ink then rubbed it with Hickory Smoke Ink to distress it & used mini glue dots to attach it to the tag. I also distressed a retired Word Stick which says "Time" with Brushed Silver & Black Soot then hung it from the cording using jewelry wire. Hope you enjoyed following how I did my tag as much as I did making it. TFL!! 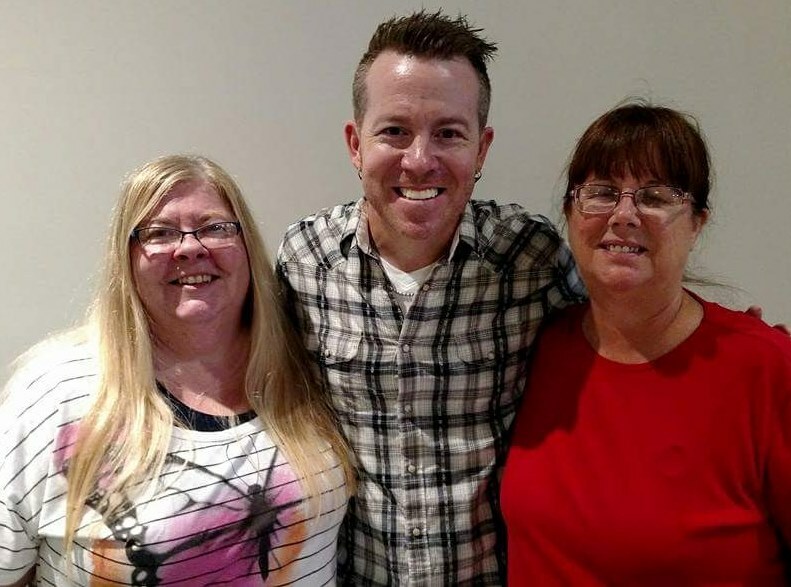 Wonderful timepiece theme on your version of Tim's tag - congrats on your win last month! My Little Piece of Heaven!